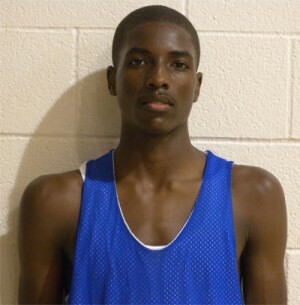 Jalek Felton 6'2 Mullins, SC 2017: He showed he has all the tools to maintain his status as one of the best players in his class for the next four years. If he gets no taller he will still be a stud. He plays with bounce, has real good court vision makes his teammates better. He handles the ball like a lead guard and the most impressive thing for me he was having fun and made sure his teammates were too. Michael Porter 6'5 St. Louis, MO 2017: His game is way beyond his years. He doesn't rush anything and lets the game come to him. He has a pure jump shot from deep and doesn't hurt he's 6'5. All I know the skies the limit for this young fella. For those who haven't heard of this Michael Porter, well you will. Wendell Carter 6'8 Atlanta, GA 2017: He has all the potential to be that guy. He has great length, a good body and a nice athlete. He looked so dominant at times then other times seemed he was going through the motions. I look forward over the next four years to decide which player he wants to be. D.J. Russell 6'6 Jacksonville, FL 2017: D.J. has a chance to be special. He played at times like a grown man. He ran the floor like a greyhound and it seemed whatever came off the glass was his. He has a lot of the tools to be successful and when he really realizes it, it will be fun to watch. Jarred Vanderbuilt 6'6 Houston, TX 2017: I was impressed both days by the big fella. He got up and down the court and got position and finished with both hands. He has a good body to fill out and get stronger. Chris Giles 6'3 Plano, TX 2017: The nay sayers can say what they want about Chris. He may not grow and kids are going to catch him. All I know he plays like a stud and went hard all the time. He has toughness in his game to maintain level regardless of who's chasing him. Deondre Bourne 6'1 New York, NY 2017: D was quick with the ball and for a young guard played with a nice pace. It's nice to see young player with good I.Q. You can tell when he wants he can lock a player down. Gregory Bowie 6'2 San Antonio, TX 2017: I love this kid’s attitude and the way he comes to play every day. He went through stations at game speed. He has lengthy wing span that makes him a problem on defense. He doesn't rush on the offensive either; he lets the game come to him. Ricky Nelson 5'11 Houston, TX 2017: After watching 'Doc' so much, you kind of forget how good he is against the guards in his class in the country. He plays beyond his years. He knows how to get everybody involved and when it's time, he can go get that bucket. He plays was major confidence and that's what you need out of your PG. Kelvin Calhoun 6'5, Warrensville Heights, OH 2017: Kevin was handful and some for his opponents. He got in the post and camped out. He knew how to get position and sit down. Once he sealed you it was over a bucket or a foul. I liked his attitude and attentiveness. Chineduvictor Uyaelumnd 6'10 Miami, FL 2017: The big guy so raw but has so much potential. He plays like he wants it, that lets me know he's going to improve and rapidly. He contested every shot that went up in the paint and he understood at the moment defense is his bread and butter.